It is well known, especially here at Well-Met, that dogs can be better and more loyal friends and family than human counterparts. This image is a haunting reminder of the bind that a man and his canine companion can have in life - and death. 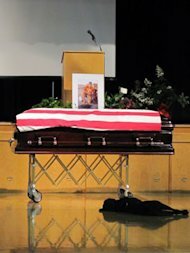 At the funeral of Navy SEAL Jon Tomlinson, one of 38 killed in Afghanistan in the Chinook helicopter taken out by a rocket-propelled grenade, his Labrador retriever was present and came up and lay at the casket and would not move. More of the story and a video of the scene can be found here.